TBILISI, Georgia (AP) - Russia expressed concern Wednesday over U.S. plans to MOSCOW - Russian Foreign Minister Igor Ivanov on Friday lamented Israel's attack on Palestinian leader Yasser Arafat's residence, saying that the spiraling Mideast crisis can't be solved by military force. There are no rational grounds for the decision by the Ivano-Frankovsk city council to rehabilitate former soldiers of the SS division �Galitchina� and grant them the same rights and privileges as veterans of the Second World War. Members of the YABLOKO faction of the Russian parliament say that there are no rational grounds for the decision by the Ivano-Frankovsk city council to rehabilitate former soldiers of the SS division �Galitchina� and grant them the same rights and privileges as veterans of the Second World War. Pskov, March 25. �People who don�t enjoy freedom of information cannot create a compatible 21st century economy,� stated the leader of YABLOKO Grigory Yavlinsky in his comments on freedom of speech in Russia for journalists in Pskov. MOSCOW - Three top lawmakers called on the State Duma's procedures committee Friday to get the ball rolling for a vote on dismissing the chamber's speaker, Gennady Seleznyov. Moscow. The Russian Democratic Party "Yabloko" and its faction in the State Duma continue advocating a review of the state programme of housing and communal reform. "One land. One nation. One life to succeed in assisting people." She decided to establish in Belarus the public union "Yabloko"�an autonomous political movement, similar in principles, goals and objectives to the Russian association "Yabloko". If you want to have a harvest in autumn, you have to plant in spring - even if the weather is bad. Now Russia is having bad weather, but it's definitely spring.' Interview with Grigory Yavlinsky). Editor's Note: Through the efforts of our researcher and interpreter, Svetlana Frantova, Rental Management was granted a rare interview with Grigory A. Yavlinsky, chairman of the Yabloko Party in the Duma (the Russian parliament). We met for an hour in Yavlinsky's cavernous office, in a relaxed conversation covering the political climate and the promise ahead for the Russian economy - which Yavlinsky regards with qualified optimism, and cautions that the promise cannot be realized without patience, perseverance and a clear sense of the realities unique to Russia, some of which linger from the past. His comments are presented verbatim, from the taped conversation. Bellona Foundation - On 18 October 2001, the Russian State Duma passed an amendment to the Law on Environmental Protection, thereby removing the last roadblocks for massive import of nuclear waste. At the same time the environmental group Ecodefense! reported that railroad wagons, destined for Russia, were being loaded with Bulgarian spent nuclear fuel. By the end of 2002 a steady flow of special trains is supposed to arrive in Siberia. Discussions on Russia and EU expansion provoked calls for the west to open up. Russia and EU expansion were the topics at the forefront of debate and discussion at this year�s Central and Eastern European Economic Summit in Salzburg. While there was disagreement on the best course to develop the Russian economy, European Union enlargement was universally welcomed. Grigory Yavlinsky rarely appears in the media nowadays. He agreed to meet with this Izvestia correspondent on the eve of Yabloko's congress scheduled to take place one of these days. He did not bother to conceal his sceptical attitude towards the media. Transcript of official letter from Russian nuclear authorities to the U.S. Secretary of Energy, dated 23 December 1998. Russian State Duma, the lower chamber of the parliament, held first reading of a bill regarding amendment of the Law on Environmental Protection to allow spent fuel imports to Russia on September 24. The Russian Ministry for Atomic Energy, or Minatom, failed to persuade Russian Cabinet members to approve amendments and forward them to the State Duma for consideration in late August. The Duma took the issue up on its own without waiting for the Cabinet. A U.S. and German industry group has developed a proposal for shipping foreign spent fuel to Russia for long-term storage. The proceeds of the venture would be a minimum of $4 billion, coming from nations trying to rid themselves of spent nuclear fuel problems. Part of this money will go to help pay Russian pensioners and orphans. President Vladimir Putin's term hit its halfway mark Tuesday, with politicians and pundits weighing in on the ups and downs of the unusually popular president's first two years in office. The main achievement of President Putin is foreign policy aimed at a rapprochement with the West. This policy was chosen by the President despite the resistance of the political elite and his circle. The vector of foreign policy can have strategic prospects and become a prologue to Russia�s transformation into a European state in the broad sense of the word � from observation of human rights to the level of the population�s welfare. MOSCOW, 22 March, 2002 /Correspondent RIA Novosti/--First deputy head of the right-wing Yabloko parliamentary faction Sergei Ivanenko announced on Friday that the faction believed that members of the SS Galichina division should not be rehabilitated. In what would amount to opening a new front in its war on terrorism, the United States is considering sending 100 to 200 U.S. special operations soldiers to Georgia, adding to the U.S. helicopters and handful of advisers already in Tbilisi to help the Three top lawmakers called on the State Duma's procedures committee Friday to get the ball rolling for a vote on dismissing the chamber's speaker, Gennady Seleznyov. The move was one of several attacks against Seleznyov by fellow deputies over the past week, but politicians and analysts said the campaign to unseat the Communist speaker could prove successful only with the blessing of the Kremlin, which has thus far remained neutral on the issue. Today we can assess the prospects of transition of Western countries to the Euro. The Euro has played a considerable role at some of the financial markets during the past month. For example, if we take the newly distributed issue of state bonds, i.e. loans performed by the government, and corporate loans, i.e. securities issued by corporations to attract investments, Euros account for about 40% of the new issues. This is considerably higher than the Euro's role in international payments and hard currency reserves. How to Manage the State Property? In general state property is governed by the Presidential Administration. Therefore, no one knows how much property we have today, who owns it, who receives incomesfrom this property, which share of the property is governed by the Presidential Administration and which is owned by the Ministry of Foreign Affairs; which part is under the jurisdiction of the Government and which is under the Defence Ministry. In other words, management of the state property is organised in such a way, that there is no clarity at all. Next week the YABLOKO party will submit to the President of the Russian Federation its concept of support for the small business sector, noted Deputy of the State Duma Igor Artemyev during a press conference on March 3, 2002. According to Artemyev, the meeting of the expert council of the party last week developed the concept. Yesterday in the Interfax office Deputy Chairman of the Duma Committee for Credit Institutions and Financial Markets, Igor Artemyev, tried to answer the question "How can we compensate for dollars lost after the fall in oil prices?". Gennadi Seleznyov was stripped of his voting rights in the Duma yesterday and may soon lose his post as speaker: that was how the majority of Duma members interpreted Unity's move. As a curtain-raiser, the speaker only lost his casting vote in the Duma Council. Afterwards the Protocol Committee was instructed to study the feasibility of replacing the speaker of the lower house. Expressed in the Democratic Manifesto, YABLOKO's "Europeanism" stipulates the establishment of a state of general prosperity that is "approximate in parameters with European standards". It sets a strategic task as well - "accession as a fully-fledged member to the European Union and other political, economic, and defence organizations of Europe." A special part of YABLOKO's program is entitled Russia's European Way. The YABLOKO party was founded in January 1995 on the basis of a coalition created for the 1993 parliamentary elections. The YABLOKO electoral bloc obtained 4.2 million votes at the 1993 elections. The faction consisted of 27 deputies sharing the platform of the liberal-democratic opposition. Yavlinsky participates in the international forum "Building Democracy in a Changing World"
On March 11-12 2002 Grigory Yavlinsky is participating in the international symposium dedicated to the problems of building democracy in a changing world, which is taking place in Guterslau, Germany. First Deputy Head of the Yabloko faction Sergei Ivanenko, in his comment on the resignation of the head of the Central Bank of Russia Viktor Geraschenko, noted that it was an "expected decision" by the President of Russia. "Russia and the United States: New Challenges, New Strategies"
MOSCOW (AP) - Four organizers of a demonstration against a journalist's Hon. Chair, distinguished colleagues, First I would like to thank the FES for this opportunity to address such a representative audience and share my experience in the Regional European Human Rights Institution - Council of Europe. The Yabloko faction of the State Duma will not support the draft law �On Mandatory Liability Insurance for Car Owners� at the review of the draft in the second reading on March 13, 2002. In what would amount to opening a new front in its war on terrorism, the United States is considering sending 100 to 200 U.S. special operations soldiers to Georgia, Legislators said Monday there was nothing essentially new in reports that the United States is preparing military contingency plans to use nuclear weapons in certain tactical situations against at least seven countries, including Russia. Russia Outlook: Will Russia Seize the Opportunity? How Will Europe Look Next Year? 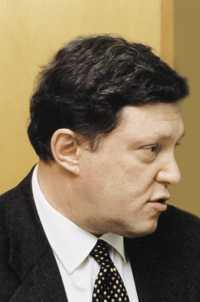 Grigory A. Yavlinsky, Member of the Russian Duma and Leader of the Yabloko Movement, expressed some pessimism about Russia's short-term economic In his remarks, Grigory A. Yavlinsky, Member of the State Duma; Leader, Yabloko Movement, Russian Federation, also referred to Kaliningrad, suggesting that its development and integration into Europe could serve as a model for what might be possible with the rest of Russia. Grigory A. Yavlinsky, Member of the State Duma and Head of the Yabloko Movement, stressed the importance of human rights and property rights if Russia is to reverse its downward spiral. There are significant difficulties. How, for example, can a decent tax system be implemented if 82% of economic turnover is by barter? Banking must be made more transparent. "The decisions made over the past week at Basmanny Intermunicipal Court of Moscow to satisfy the USD 1.5 million demands of the plaintiffs against Novaya Gazeta is a convenient way of closing a disturbing newspaper." This was the statement of Sergei Mitrokhin, deputy of the State Duma from the Yabloko faction and Deputy Chairman of the YABLOKO party on the situation around Novaya Gazeta. The Russian Democratic Party YABLOKO will join Liberal International as a fully-fledged member of this international political organisation which joins together liberal-oriented political parties. Try to solve this puzzle: Two world leaders that are behaving like political twins. Both have chosen security and order as their priorities and have used war to consolidate society. Both prefer to avoid coalition-building and are fascinated by military might. Neither thought much about the highest office in the country beforehand and both were amazed to find themselves ascending to it. �Not surprisingly, there is some weariness in politicians� comments about TV6 � most were used during the recent conflict around NTV. These two stories have a lot in common - the same team headed by the same leader, Yevgeni Kiselev, faces the same situation again. The leader of the Yabloko faction of the State Duma Grigory Yavlinsky shares his opinion with our readers on ten years of reforms in Russia. Roll-call Voting i nthe State Duma for the adoption of the law "On Insolvency(Bankruptcy)"
On February 27, 2002, the Federation Council of the RF supported the amendment to Article 37 of the RF Criminal Code that would expand the right of citizens to self-defence in the event of criminal attacks. The draft law "On Amendments to Article 2 of the Federal Law "On State Regulation of Electricity and Heating Tariffs in the RF" aims to make electricity and heating tariffs predictable and controlled. The State Duma will review the draft law submitted to the Duma by a group of deputies on February 13, 2002. Deputy of the Yabloko faction, Mikhail Zadornov, Deputy Chairman for the Duma Committee on Budget and Taxes authored the draft. In what would amount to opening a new front in its war on terrorism, the United States is considering sending 100 to 200 U.S. special operations soldiers to Georgia, adding to the U.S. helicopters and handful of advisers already in Tbilisi to help the Georgian military combat terrorists in the lawless Pankisi Gorge. THE most important positive political development of 2001 is, without doubt, the set of decisions taken by the country's leadership in the wake of Sept. 11. TBILISI, Georgia (AP) - Russia expressed concern Wednesday over U.S. plans to train troops in Georgia to fight rebels allegedly linked to Osama bin Laden's al-Qaida terror network. A Georgian defense official said a few American advisers were already in the former Soviet republic.